From New York Times bestselling author Peter Robinson comes this mesmerizing story-within-a-story about a man pulled into a murder from the past—and his quest to uncover the truth. Quietly reeling from the death of his beloved wife, Chris Lowndes decides to return to the Yorkshire Dales after twenty-five successful years spent in Hollywood composing film scores. He purchases Kilnsgate House, a charming old mansion deep in the country, but something about the place disturbs him. His unease intensifies when he learns Kilnsgate was once the scene of a sensational murder. More than fifty years earlier, prominent doctor Ernest Arthur Fox was poisoned there, allegedly by his beautiful and much younger wife, Grace, who was subsequently tried, condemned, and hanged for the crime. 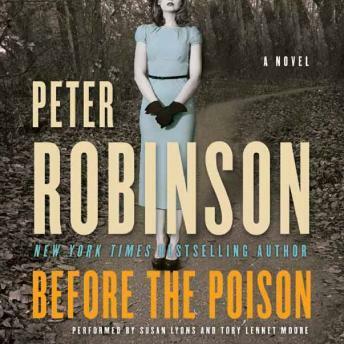 A complex, multi-layered thriller, Before the Poison is one of Peter Robinson’s most brilliant novels—and one readers won’t soon forget.